They're back ! With no brand new acts ! Was kinda shocked when Nic told me that they're back and they will be touring end of the year. There goes to show how outdated I was on all these entertainment news. I don't have much time for TV so E! 's out of my life momentarily, and I've stopped reading SmashHits a decade ago. Nic was so furious that they didn't included Malaysia in their tour itinerary. Come on .. Singapore will have a bigger chance to be on the list than Malaysia. Haha. The Spice Girls. Not so spicy anymore it seems. Mel C (far left) is the only one that looks good, or much betta since they've split, as if she went to explore the world of modelling ... while the others explored the world of motherhood. The rest look old man! 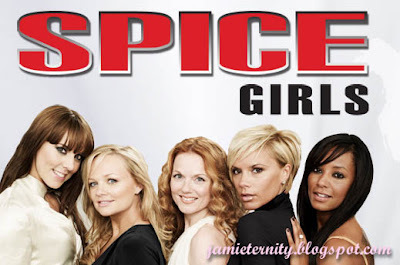 The whole Spice GIRLS just don't seem to blend well with the image. Decently clad in demure attires and subtle middle-age styles ... ain't spicy at all. Some Desperate Housewives replica. I can imagine these middle-age woman shaking their booty to teenage music. All wearing outrages skimpy PVC outfits and yucky platform boots. Geri with her Union Jack, Emma with her pink Britney-ala-virgin fluffy feathery tutu (ewww...wats worse to have auntie acting cute! ), Victoria .. she'll be fine with her basic plain Black or White .. she has style so I'm with her, if only she could smile a wee bit more. Mel B in animal prints .. which I so prefer her to do military instead. Mel C is fine too .. how wrong can you go in Adidas? They have to resurface with how they're being remembered for rite? They can't just switch identities rite. Jamie: I'm so gonna blog about this now man! Nic: You say nice things about them H** T***! Nic: Don't be evil P*** H** T*** ! Jamie: I can imagine man .. all old man and fancy calling them teenage names. What's with the "GIRLS" and "BOYS"
So if the next time a new band pops up in the music scene with the name "girls" or "boys" in it, it'll definitely be short-term. It goes to show that they do not plan for themselves to stay in the industry for the next 2-3 decades coz definitely the band name has to last for the number of years that they plan to last right? But on a more positive note, I admit I used to like 'em .. not worship them obsessively like Nic does . I'm sure we all somehow know the lyrics subconsiously and sing to the tune whenever we hear them. Just admit it ! As much as you hate to admit it .. they're part of our present lives, we live through it .. and they're back to haunt us again ! hahahahah this is hillarious la... jam... u're sooooo funny!!! m goin crazy now! 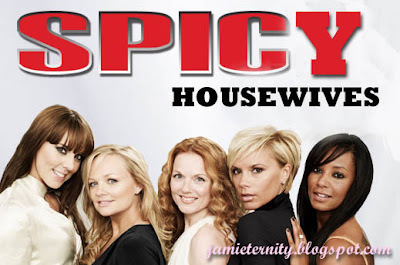 Apa Spicy Housewives ni ah???? And its NOT hilarious OR funny either, HafliiiiiiiiiiiiN!!!! I don't care if they haven't got any new songs (this is a reunion tour, not promo tour), I don't care if they look rather old (you gotta expect that, and they don't look old, mature more like it), and I certainly don't think they'll be wearing their trademark outfits anymore, H** T***!!!!! I just want them to come play in KL... or at least Singapore!!!! Where its nearer than Hong Kong or OZ.